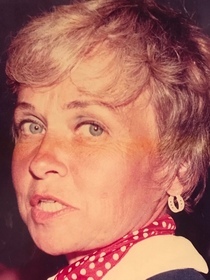 Marguerite “Peggy” Fanning passed away on December 14, 2018 in Cape Coral, FL surrounded by her loving husband and family. Peggy was born in Dunmore, PA on March 14, 1930. She graduated from St. Paul High School in 1948. An expert typist, she soon joined the administrative staff of the Tobyhanna Army Depot. In 1955 she married the love of her life, Martin Fanning. Together they raised seven children Marguerite (Tom) Ringwood, Martin III, Mary Kathleen (Geoff) Baer, Mark (Victoria) Fanning, Mitch (Tracey) Fanning, Marlyn Fanning and Murray (Alexis) Fanning. In addition, they have 18 grandchildren and two great-grandchildren. During the early years of their marriage, Marty’s career carried the family across four states with Peggy making every move look easy. In 1967 she and Marty settled in their beloved Auburn where Peggy was somehow able to volunteer at Sacred Heart and St. Ann’s parishes while raising her seven children. For years Peggy ran the used book sale at St. Ann’s Annual Chicken Barbeque. After her children were grown, Peggy worked for Boni State Farm Insurance Agency in Auburn where she loved her co-workers and customers. In retirement she and Marty travelled the world and divided their time between Owasco Lake and Cape Coral, FL, allowing her to enjoy two of her favorite things, the sun and the water, year-round. The world simply won’t be the same without Peggy. She brought light, laughter and love to every life she touched. Her husband adored her, her family cherished her and her friends delighted in her company. Peggy loved life and loved people. She was an amazing listener who enjoyed nothing more than learning someone’s life story. She was also perpetually in motion. She loved to walk and swim and did one or both nearly every day. She loved music and theater and had the voice of an angel. For years she performed a glorious solo of O Holy Night at Sacred Heart’s Christmas Mass. The matriarch of a large family who preferred her grandchildren to simply call her “Peggy”, she made every child and grandchild feel special and loved. She was a constant source of encouragement, wisdom and support who always seemed to have the right words at the right time. A voracious reader and wonderful writer, particularly of poetry, Peggy had a number of her poems appear in major publications. Peggy and Marty suffered devastating tragedies with the loss of their son, Marty in a motorcycle accident in 1980 and daughter, Marlyn in a motor vehicle accident in 1988. When asked how she persevered through such shattering heartbreak Peggy would respond: “My children have lost two siblings, I can’t let them lose their mother too.” She was truly an extraordinary woman. A devout Catholic, Peggy was a living example of Christ’s teachings. She put others before herself, treated everyone with love and kindness and bore hardship with faith and grace. Peggy will live on in the hearts of everyone who knew her, for to know her was to love her. In addition to Martin III and Marlyn, Peggy was predeceased by her parents Walter and Marguerite Barrett Regan, her brother Walter Regan and sister Ann Demaio. Friends are invited to join the family for a Mass of Christian Burial which will be celebrated at 10 a.m. Saturday, December 22, at Sacred Heart Church, 90 Melrose Road. Burial will be in St. Joseph Cemetery. Calling hours will be at Sacred Heart Church, Auburn on Friday December 21 from 4:00 pm to 7:00 pm.